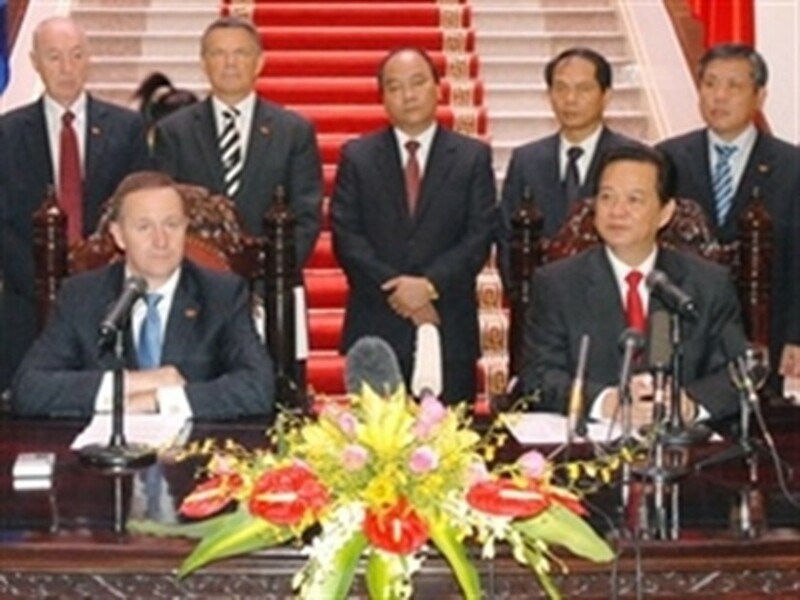 New Zealand will allocate 10 million New Zealand dollars (about 7.1 million USD) in aid for Vietnam in the 2010-2011 fiscal year. This was announced by New Zealand Prime Minister, John Key during talks with his Vietnamese counterpart, Nguyen Tan Dung, in Hanoi on July 12, following an official welcoming ceremony. PM Dung welcomed New Zealand for increasing its aid for Vietnam year by year. He also highly commended the Pacific country’s continuous provision of postgraduate and English training scholarships for Vietnam, as well as its reception of 200 Vietnamese workers in 2010. The Vietnamese PM expressed hope that PM Key’s visit would create a new momentum in the relationship between the two countries, especially during celebrations of the 35th anniversary of diplomatic ties. PM Key said he was happy with his first visit to Vietnam, where he was given a warm welcome. The NZ leader congratulated Vietnam on her ASEAN Chair in 2010 and expressed his belief that with its young and dynamic population, Vietnam would grow stronger in the future. He agreed with PM Dung’s proposals to boost bilateral cooperation in a wide range of fields, notably politics, security, defense, economy, trade, education, training, science-technology, environment, and labor. The NZ PM noted that the ASEAN-Australia-New Zealand Free Trade Agreement (AANZFTA) that came into force in January this year and Vietnam’s participation in negotiations on the Trans-Pacific Strategic Economic Partnership (TPP) will open a great number of new cooperation opportunities for the two countries in trade and investment. After presenting their own views, both PMs showed satisfaction at developments in their countries’ friendship and wide-ranging cooperation, particularly since they established a comprehensive partnership in September 2009. They spoke highly of the two countries’ future signing of an action plan for the comprehensive partnership in the 2010-2013 period, which is scheduled for later this month on the sidelines of the ARF meeting. The two PMs agreed to continue working closely at regional and international forums. PM Dung noted New Zealand’s suggestion for Vietnam’s support for its candidacy to the non-permanent member seat at the UN Security Council for the 2015-2016 term. He also affirmed that Vietnam, in the capacity of ASEAN Chairmanship, would exert efforts to promote ASEAN’s ties with New Zealand. At the talks, PM Dung invited PM Key to attend the East Asia Summit (EAS) and ASEAN’s related meetings in October, and PM Key accepted the invitations with pleasure. PM Dung also asked his counterpart to pass on an invitation to visit Vietnam to the NZ Governor-General. Later, the two PMs met with the press and joined a state banquet which was hosted by PM Dung.